When it comes to the Gold Coast, the entertainment is endless. The area’s natural highlights include expansive rainforests and over 70 kilometres of coastline prime for surfing, while local attractions such as Seaworld, Currumbin Wildlife Sanctuary, Blues on Broadbeach Music Festival, the Q1 Building, and the infamous Gold Coast 600 ensure that a new adventure is always waiting for you! A Gold Coast limo service is ready to hep start your next adventure right. Limoso provides luxury limo hires in the Gold Coast from Southport to Byron Bay. Why wait for a taxi when you can tour the coast or get an airport transfer on your schedule? Our limo services cover all parts of Gold Coast and Brisbane: Robina, Kingscliff, Ocean Shores, Surfers Paradise, Main Beach, Broadbeach and Byron Bay. Whether you're sightseeing or surfing, Limoso Limousine Services has you covered! We have affordable limo hires for Gold Coast to Brisbane and all surrounding areas in South East Queensland. With so much to see and do, getting there should be the least of your concerns. That’s why Limoso is proud to offer luxurious Gold Coast limousines for any occasion. From wedding and formal cars to Gold Coast airport transfers: we are equipped to meet any of your travel needs – regardless of group size, destination, or other customized requests. Airport transfer services are, also, offered to Gold Coast Airport and Brisbane Airport, so make your next flight on time and in style. Book your Gold Coast car service for airport transfers and more! Limoso offers limo hires in Gold Coast including: wedding limousines, executive transportation, school formals, and Gold Coast Airport transfers. The Gold Coast is a great vacation spot and a Limoso car service is a great way to see all of it. Amusement parks in the area include Dreamworld, Wet'N'Wild, Warner Bros Movie World, and Sea World Gold Coast. Other landmarks work visiting include Snapper Rocks in Coolangatta, Captain Cook Memorial and Lighthouse, Surfer's Paradise Beach, and Currumbin Wildlife Sanctuary. Reserve a Limoso luxury car hire in Gold Coast and see the what the city has to offer for yourself. To find the perfect vehicle for your next Gold Coast visit, feel free to peruse our fleet, or get started booking today with our easy-to-use reservation portal! Besides airport transfers in Gold Coast, Limoso also provides chauffeured car hires to Sydney and Melbourne. Sheraton Grand Mirage Resort, Gold Coast - 71 Seaworld Dr, Main Beach. Need a ride to Brisbane? Reserve transfers between cities with Limoso as well. 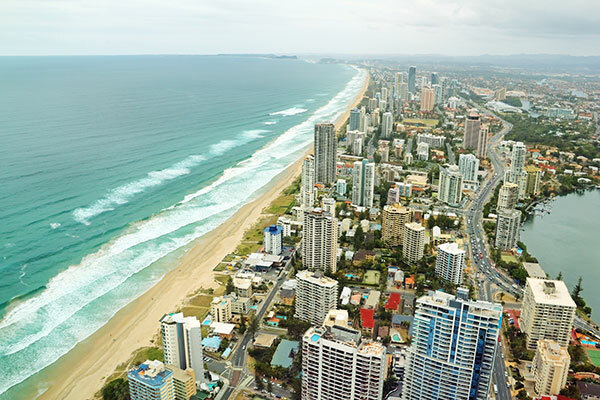 We offer rides between Gold Coast to Brisbane, Byron Bay, Broadbeach, Surfers Paradise, Southport, Coolangatta, and more. Our car hires are the perfect way to travel on your schedule. Enjoy your next holiday with us! From wedding car hires to Gold Coast airport transfers, Limoso is a leader for luxury travel throughout Gold Coast, Brisbane, and more. We can get you to or from your Gold Coast hotel to the Brisbane Airport on time and in style! Are you ready to book your Gold Coast limousine? It's the best luxury car hires and people movers in Gold Coast, Surfers Paradise, Main Beach, and Broadbeach. Book your trip to Sea World Gold Coast or reserve a Brisbane Airport to Gold Coast Airport limo hire today! Get started with our simple online reservation portal now!